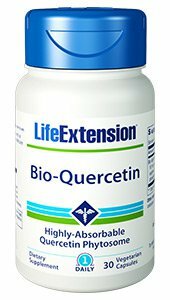 Bio-Quercetin: Quercetin is a bioflavonoid that supports healthy immune function and inflammatory response, promotes cardiovascular and endothelial health, and more. Our new Bio-Quercetin supplement provides quercetin encased in a plant-derived phytosome delivery system, which makes absorption easier: the quercetin in our formula is up to 50 times more bio-available than a dose of standard quercetin. Try Bio-Quercetin today! Our new Bio-Quercetin contains a form of quercetin that has been integrated into a phytosome. A phytosome is a tiny sphere made out of plant-derived phospholipids. By combining quercetin with this unique phospholipid-based delivery system, the quercetin in this formula is more bio-available. This makes it easier to absorb and more easily utilised by your body. In a randomized clinical study, researchers compared two orally administered quercetin phytosome doses (providing 100 mg and 200 mg of quercetin), along with one 500 mg dosage of traditional quercetin. They found that the quercetin phytosome could be administered at one-fifth the dosage of the traditional quercetin and still result in exposure 10 times greater. This means that the quercetin phytosome provides about 50 times greater bio-availability than traditional quercetin. Quercetin has a long tradition of use relieving the effects of seasonal immune challenges. In a randomised clinical trial, quercetin supplementation encouraged a healthy immune response in physically fit older adults. Another randomised controlled trial found similar results in trained athletes. And in double-blind clinical trials, quercetin promoted a healthy inflammatory response, reduced oxidative stress, and helped maintain overall health. Quercetin promotes both cardiovascular and endothelial health and helps maintain healthy blood pressure already within the normal range. Quercetin is also a potent inhibitor of oxidative stress, and helps promote a healthy inflammatory response. Get the most out of your quercetin supplement. Choose Bio-Quercetin today!